There is nothing like having your first place all to yourself! 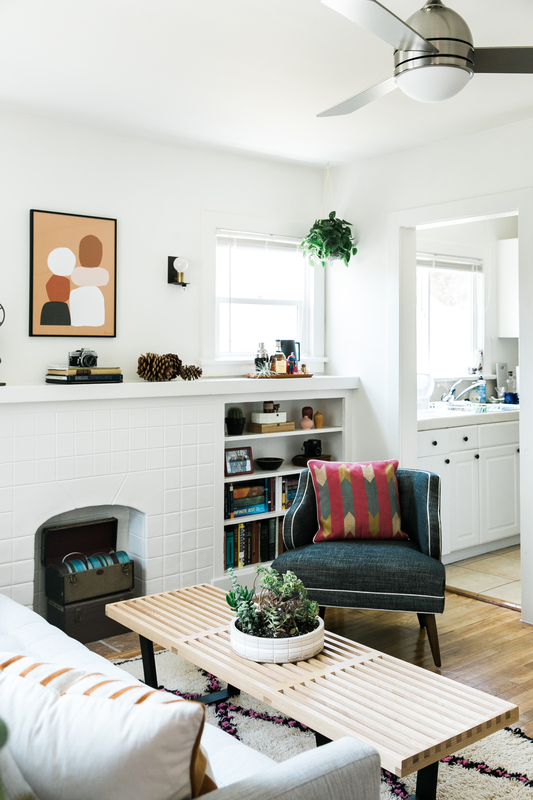 So when my BFF Caroline’s little brother Robert moved into a charming LA bungalow after years of living with roommates, we jumped at the chance to design and implement the living room of his dreams to commemorate his big step up! This project has been months in the making and we are so excited to reveal it at last. Robert is the sweetest, smartest, most sensitive soul you’re likely come across (if I were single and ten years younger…!) 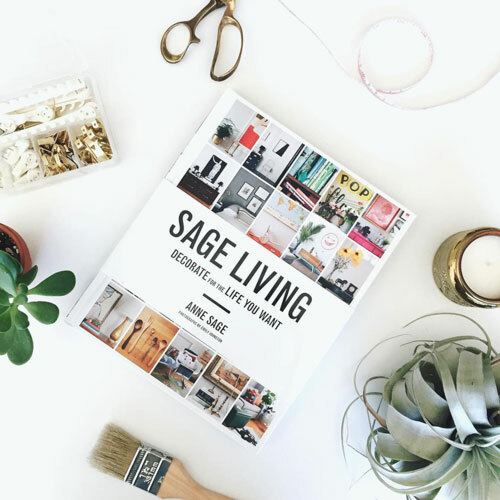 so we wanted to give him a living room makeover that was at once stylish but not trendy, functional but still aesthetically appealing, and above all comfortable! 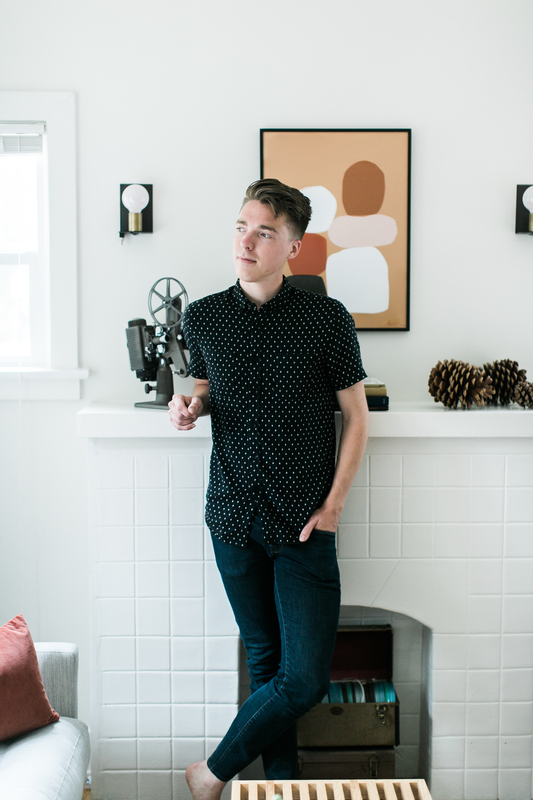 Robert is a filmmaker with a finely honed visual instinct. 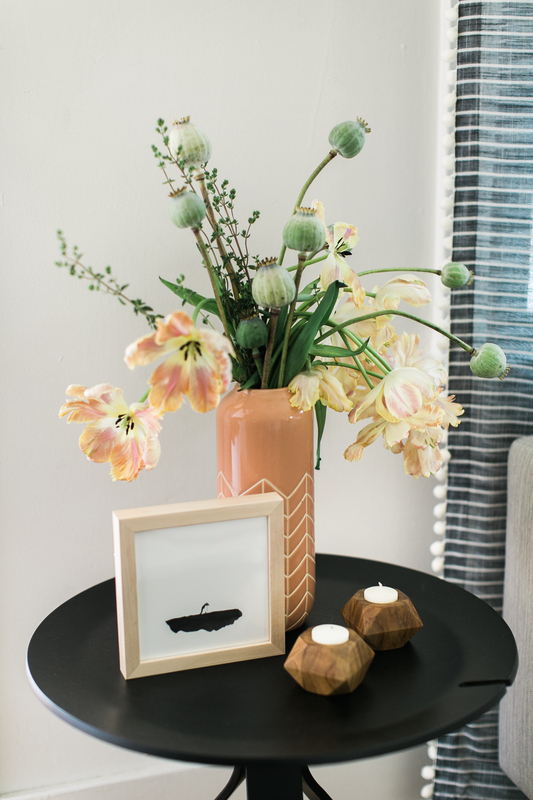 He knew he wanted to hang some of his own fine art photography work on the walls, so we used his pieces as the jumping off point for our palette and overall vibe. 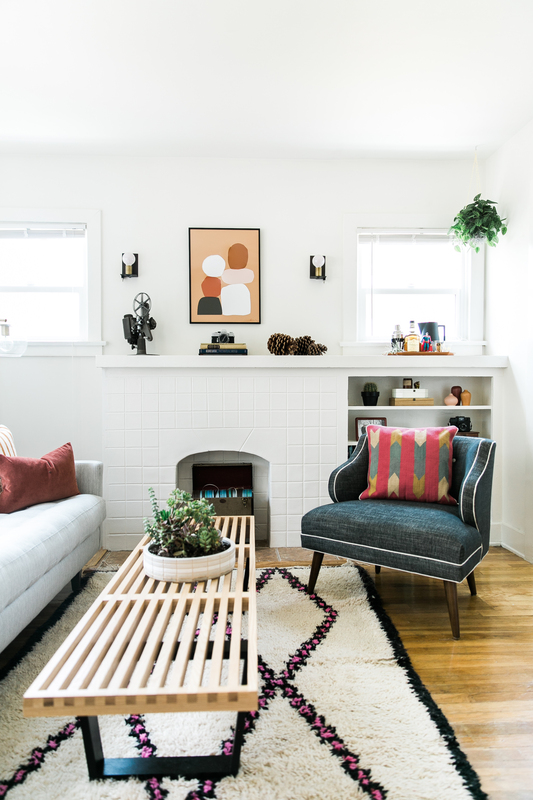 Simple, midcentury silhouettes suited his desire for a relatively gender neutral space—his request was for a bachelor pad that didn’t feel like a bachelor pad—and hues of sky, slate, rust, and ochre set the scene for soothing yet dynamic space. For our large upholstered elements, we chose a sofa from the Rowe Modern Mix Collection, covered in Crypton Home Fabric, and a Huntington House button tufted chair in Crypton Home Fabric‘s Nomad weave. The sofa’s comfy bench cushion will accommodate hours of reading and TV viewing; the chair is deep and inviting; and the two pieces’ versatile shapes and colors have major longevity! Plus, Crypton Home Fabric is impervious to stains and wear, meaning Robert can get years of use from his new furniture. Once we’d picked out the big pieces, it came time to choose our supporting items. A slat bench from Lulu & Georgia nicely compliments our subtle midcentury sensibility, plus it can serve as extra seating when Robert entertains. 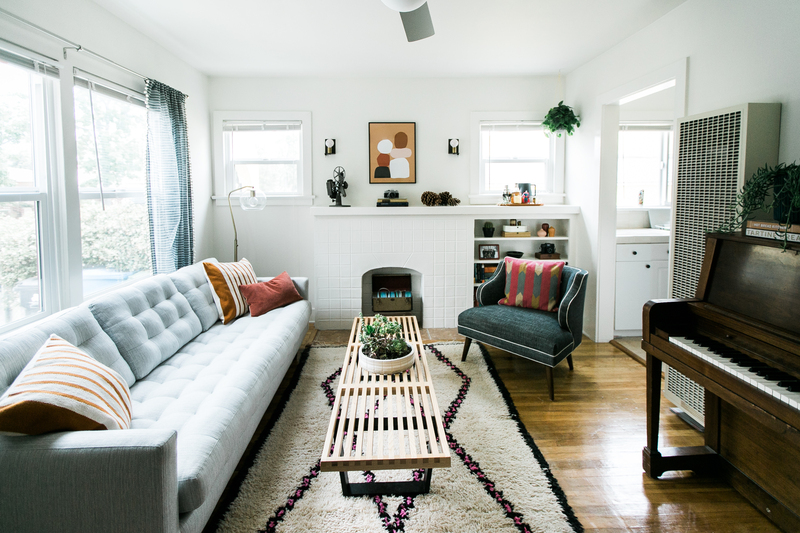 A Coco Carpets vintage Moroccan rug adds texture plus a dash of saucy color. 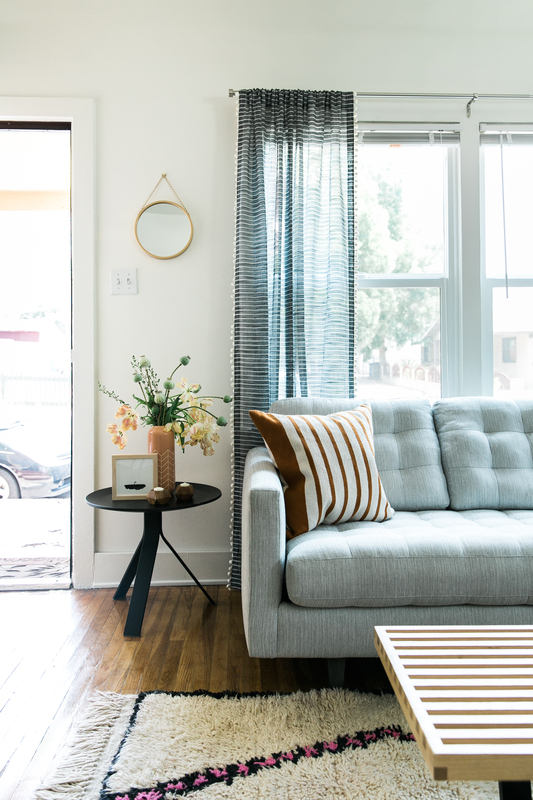 Then, in order to make his rental feel a little more personalized, Robert happily put on his electrician hat and swapped out his landlord-issued light fixtures! 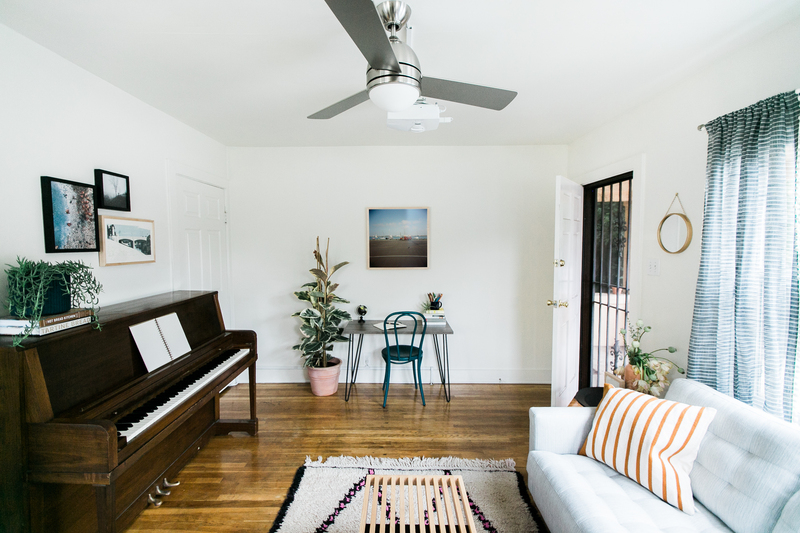 A brushed steel modern ceiling fan from Lamps Plus has a clean, contemporary presence and quietly circulates air throughout the small room; and two Schoolhouse Electric wall sconces echo the candle sconce of days past but with a quirky globe bulb update. 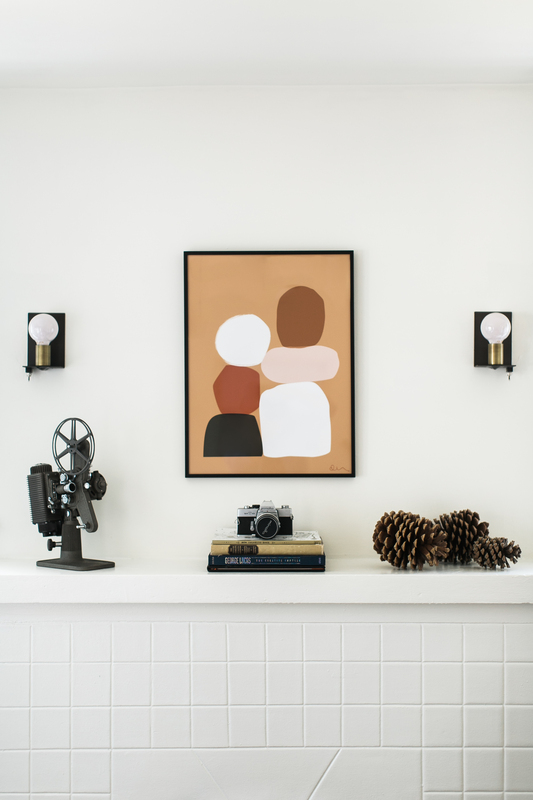 They mirror the shape of the brass floor lamp in the corner—and they so beautifully flank the Schoolhouse Electric abstract shapes print that hangs over the fireplace! As for the other half of the room, Robert wanted an area where he could both dine and get work done. 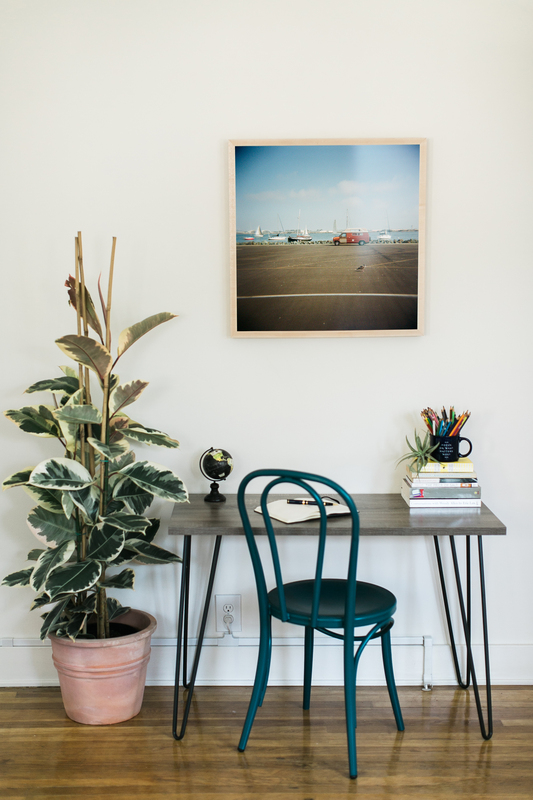 The square footage of the room wasn’t huge, so we selected a hairpin leg table that’s petite enough in scale not to block the entryway but that can still serve as both dining surface and desk. The washed grey wood surface plays nicely with the blue bentwood chairs we paired it with. 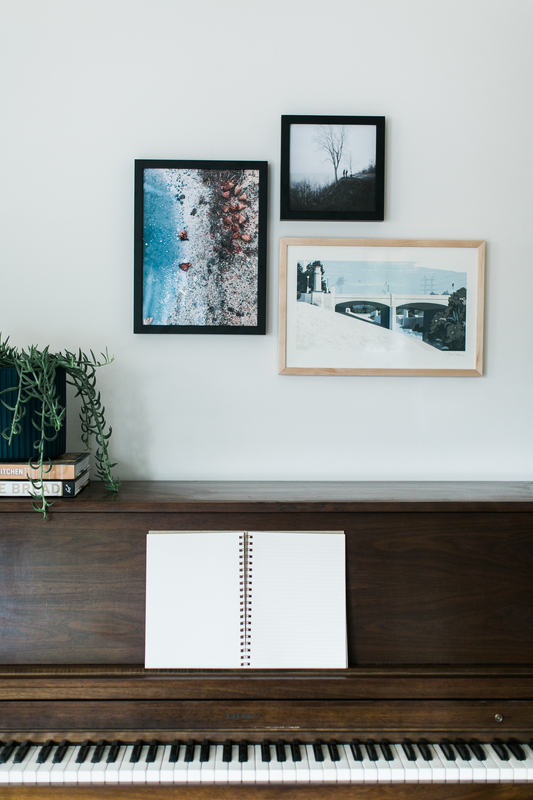 The artwork hanging over the desk as well as over the piano is either of Robert’s own creation, or by friends and local artists; we sent everything to Simply Framed, who did a brilliant job of custom framing everything in a mix of natural and black gallery style frames. As for the finishing touches, I didn’t want to overload Robert with knickknacks so we kept things relatively sparse. Sheer striped curtains just happened to be the exact same shade as the chair (love those happy decorating accidents!). A woven Lulu & Georgia cushion provides vibrance that echoes the spirit of the rug, while striped kilim pillows anchor the sofa. 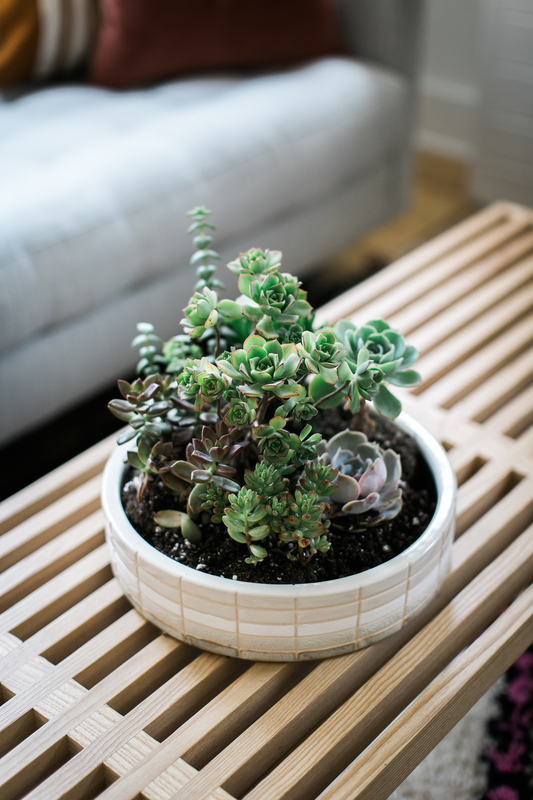 Succulents in a ceramic planter bring life to the coffee table, a teal textured planter and hanging planter house even more greenery, and a trio of tiny vases completes the palette statement started by the artwork. 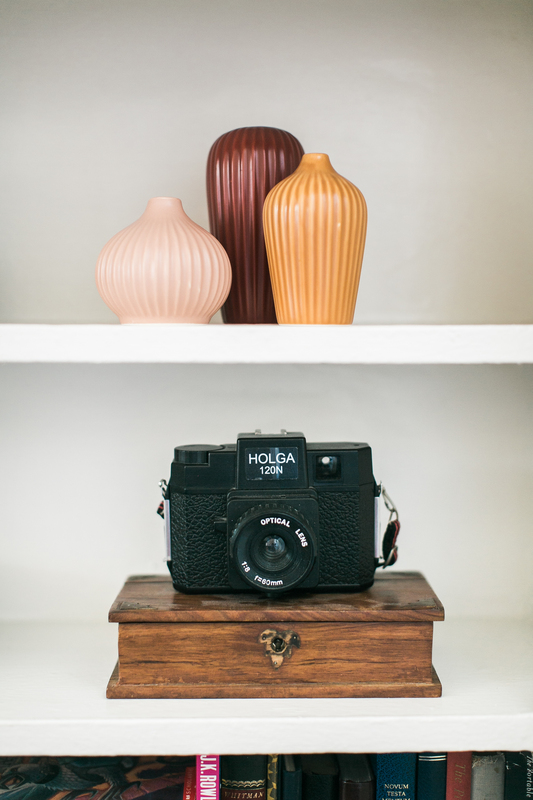 Everything else—the books, boxes, and vintage cameras—were Robert’s previous possessions, now part of a growing collection for this grown-up, very stylin’ guy! Photography: Jayden Lee for Echo + Earl. Video: Robert Ingraham for Echo + Earl. Master the Art of Last Minute Entertaining, Italian Style!